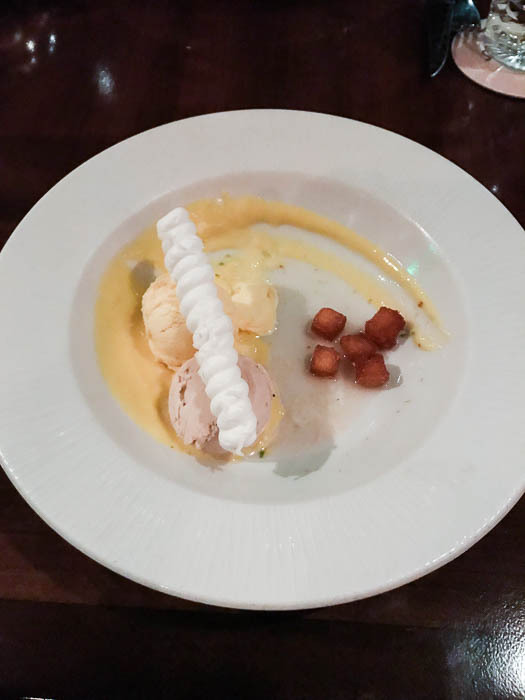 This Tiffins Restaurant dinner review is based on my experience when visiting the restaurant in November 2017 with my family. Tiffins is a Signature Dining restaurant located in the Discovery Island section of Disney’s Animal Kingdom Theme Park. They serve African, Asian, and Latin cuisine. While this restaurant is considered “fine dining” you do not need to dress up to eat there. In fact, while we were there, several kids were running around without shoes on! Please note that Tiffins will use 2 entitlements per person because it is a Signature Dining restaurant. We did make reservations for all of our meals ahead of time. I would highly recommend doing this as soon as you book your trip, especially if you will be travelling during a busier time of the year. I first want to apologize for the lack of some photos. While some of the photos are not of the best quality due to dim lighting, some simply could not be salvaged, even with editing. We did not want to disturb other diners by using the flash. 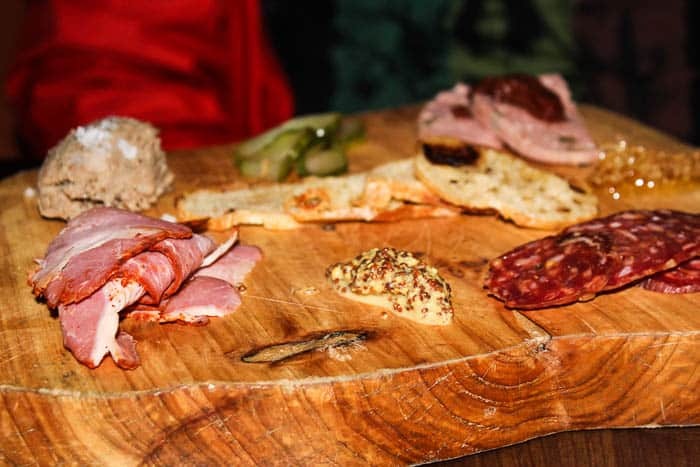 Leave it to my fiance, Daryl, to order the Charcuterie Board! It came with Wagyu Bologna, Ethiopian Coffee-Pork Terrine, Duck Pastrami, and Speck and was served on a large piece of wood. There was also pickles, honeycomb, mustard, and slices of crostini. 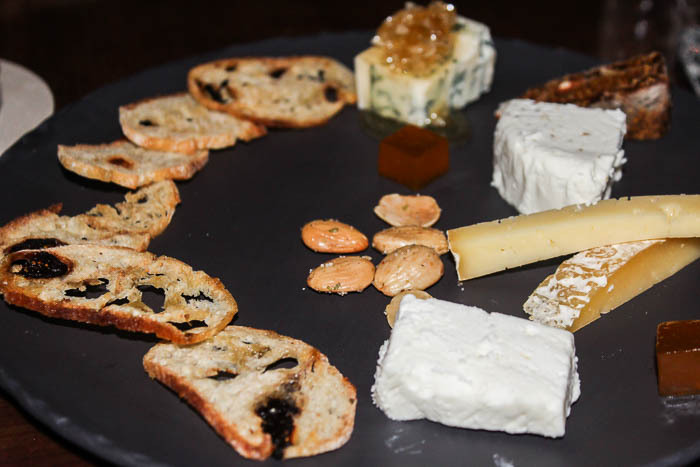 And, leave it to me to order the cheese! My appetizer came with a chef’s selection of accoutrements. While I love cheese, I couldn’t say for certain what each one was. There was a nice variety in flavors as well as honeycomb, almonds, and crostini. Tiffins has a children’s menu, but since our son is 10, he ordered from the adult menu. He was not familiar with many of the choices, so he opted for the Tiffins Signature Bread Service. It comes with Tadka, Black-Eyed Pea Hummus, and Zhough Yogurt for dipping. He tried them all and liked them all! For my entree, I choose a seasonal special. It consisted of different types of squash, sweet potatoes, and seasonings. Daryl said it’s the first time he’s seen me clean my plate! It was really delicious. I have not been able to find a more detailed description of it and it’s no longer on the menu. This beef entree was served with rainbow carrots, purple potatoes, Citrus-Ramp Butter, Guava Demi-glace. Its cooked to ordered and was a nice-sized serving. Jax played it safe with the Pomegranate-Lacquered Chicken. 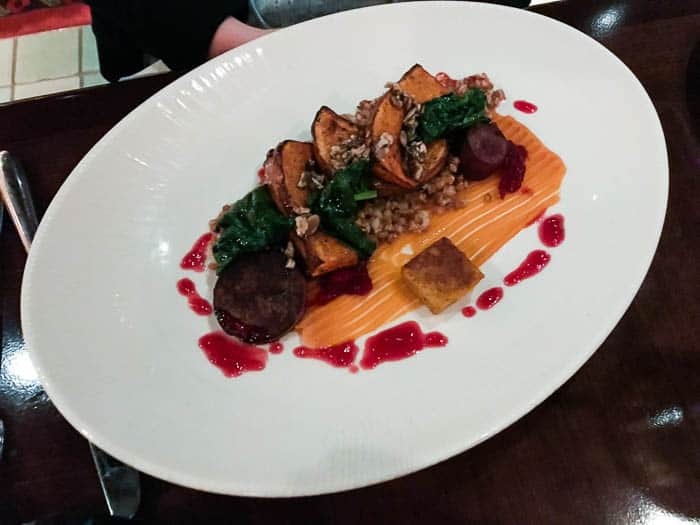 It is usually served with sweet potato polenta, thumbelina carrots, and a citrus-fennel salad, but they allowed us to substitute rainbow carrots and purple potatoes for him. To my surprise, he ate almost his entire dish! The Sorbet Tasting consisted of 2 different flavors. The dessert is described as: Kaffir Lime Syrup, Passion Fruit Curd, Crunchy Vanilla Crouton on the menu. Daryl almost always orders ice cream, gelato, or sorbets for dessert. He really enjoyed these, especially the passion fruit! Jaxon and I both ordered the South American Chocolate Ganache. It was served with caramelized bananas and a cocoa nib tuile. 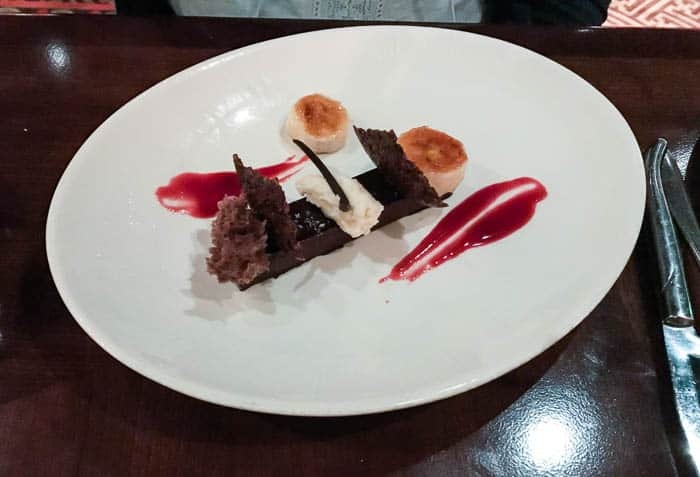 This is a very rich dessert, but that didn’t stop either of us from finishing it – just delicious! While we really enjoyed the food at Tiffins, I’m not sure we would chose to go back using a Disney Dining Plan since it takes 2 entitlements for each person to eat there. It also wasn’t a great choice for older kids whose palates may not be as refined. If it was just my fiancé and I, we might reconsider because the food really was fabulous! Because the menus are always changing, I can’t guarantee the same selections will all be available as in this Tiffins Restaurant Dinner Review. To see the current Tiffins menu and prices, click here!